For many years the songs created by British soldiers of the First World War were lost or forgotten. But in the 1960s the prolific BBC producer, Charles Chilton, began to research his father who had been killed in Arras in March 1919, aged only 19. Through his quest Chilton discovered the songs of the First World War which were created or adapted by soldiers in the trenches. Many of the songs were found by Chilton in The London Library in an obscure book called, "Tommy's Tunes". These songs, with their gallows humour, strong language, and often moving renditions of traditional tunes provided Chilton with a pioneering programme for BBC radio called 'The Long, Long Trail', which was broadcast in 1961. It is now regarded as a ground-breaking masterpiece. 'The Long, Long Trail' consisted of soldiers' songs interspersed with the bare facts of the war. 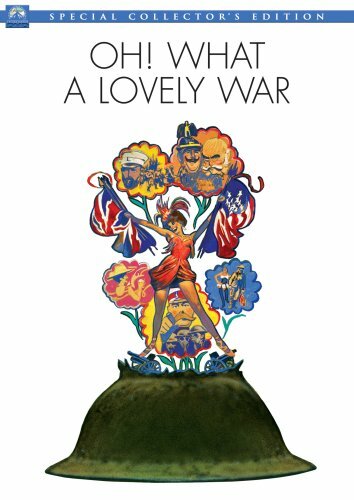 This sparse approach had an immediate, emotional impact which would be the foundation stone of the radical theatrical production at London's Stratford Theatre Royal, 'Oh What a Lovely War' and the subsequent film of the same name directed by Richard Attenborough. Chilton's programme revealed a part of working class history which had hitherto been forgotten or ignored. Join Up! Serve Your Country! 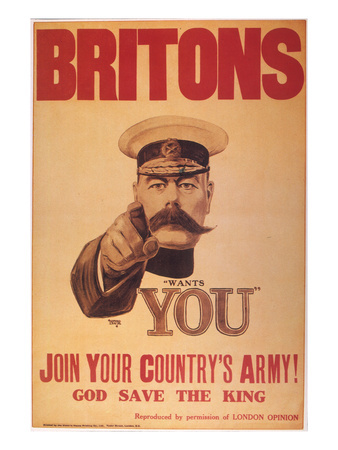 On 4th August 1914 Britain entered the First World War. The atmosphere was optimistic and deeply patriotic. Embarking for the continent, troops were keen to help out little Belgium which had been invaded by Germany. They sang the popular songs of the day such as, It's a Long Way to Tipperarey and Are we Downhearted? No!". The recruiting drive, which began immediately, was boosted by music hall artists who sang songs such as, Oh we don't want to lose you and the emotionally subversive, I'll Make a Man of You. Some women also took it upon themselves to hand out white feathers, the mark of cowardice, to those who hadn't yet joined up. Here is Maggie Smith, as a music hall artist, singing, I'll Make a Man of You from the film, Oh, What A Lovely War. The view here is that songs such as these were a cynical ploy to encourage men to join up. Later the soldiers themselves would make up their own sardonic words to this song. Living on the earnings of a lady typist. But the war dragged on and as conditions in the trenches worsened and casualties mounted, enthusiasm for the conflict was replaced by a much more sober attitude. 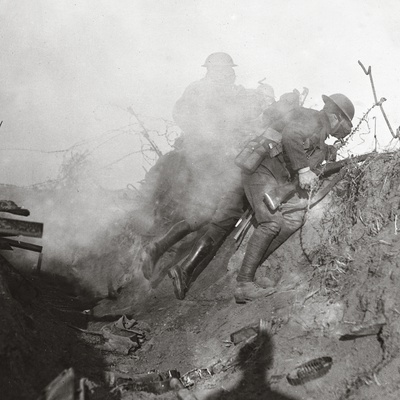 In the trenches the soldiers themselves lived with the stench of death, the scourge of trench foot, rats, lice and the threat of shells, or 'whizz-bangs' as they were called. 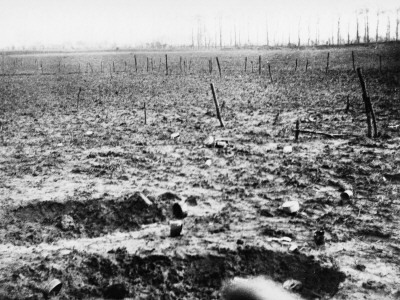 And beyond the trenches and the barbed wire was No Man's Land, a stark stretch of muddied wasteland littered with the bodies of both antagonists, beyond which were the trenches of the opposition, who were equally besieged. A whizz-bang would announce its arrival with an ominous whine, which could mean certain death. Down in the dugout and say your prayers. And it’s heading straight for you. If a whizz-bang hits you. There was also the threat of mustard gas, or Yperite, which was first used by the German Army in September 1917. 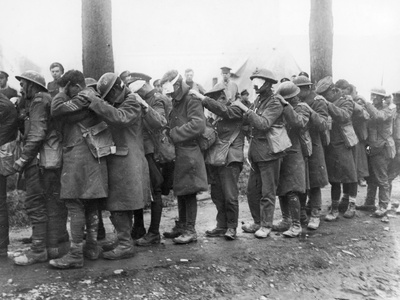 The horrendous effects of this gas, which caused blistering, blindness and a slow death, were met with typical resigned humour and stoicism by the British troops. So one of us can use it all alone. 'Cause one of us can fill it all alone. Treatment of ordinary soldiers by their superiors was often humiliating and extremely harsh. Shell shock was little understood so that Illness and fear - which prevented a recruit from 'going over the top' into No Man's Land - was inevitably labelled as cowardice, and could result in execution by firing squad. Bullying and fierce intimidation was common. Yet despite all these horrors, the songs of soldiers in the trenches reflect a refusal to give in to despair. Such ironic subversion was a phenomenon exclusive to British troops. And as well as singing about the conditions they had to endure in the trenches, the troops were not slow to criticise their superiors through the medium of song. Here's one to the tune of John Brown's Body. It takes a knowing, anti-authoritarian look at what was perceived as the meaningless charade perpetuated by the higher ranks whose strategies made no sense at all to those on the ground. One staff officer jumped right over another staff officer's back. And a fourth staff officer jumped right over all the other staff officers' backs. In 1916 Captain Fred Roberts found an old printing press in the ruins of Ypres in Belgium. He began using it to publish a satirical newspaper called The Wipers Times. 'Wipers' was army slang for 'Ypres'. 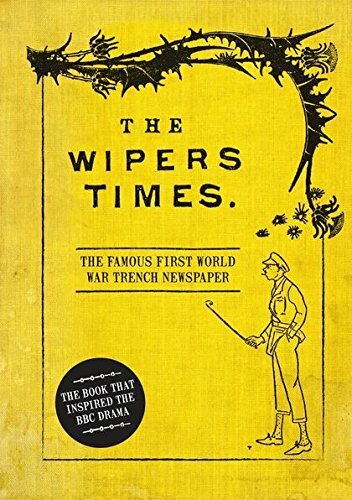 The Wipers Times was an immediate success, being full of very funny subversive articles, jokes and poetry that was often very moving. 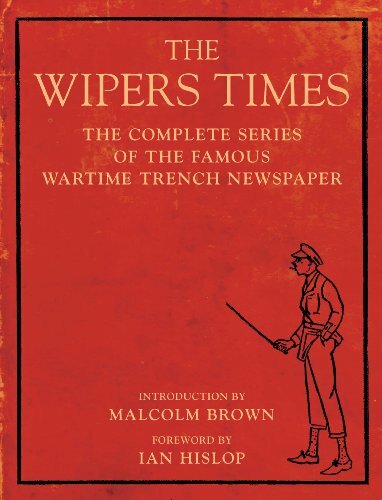 Despite being printed under fire, The Wipers Times was incredibly popular with all the troops along the western front. It was another means by which the songs of the trenches were passed around the troops. It reinforced the gallows humour and resignation that became a coping mechanism, enabling soldiers to fight the fear promoted by long stretches of boredom, watching and just waiting. Many of the songs concerned the merits of alcohol, arguing that bravery could only be achieved through booze. Ironically, these pieces were written by men who would later be given medals for bravery - and also, there was a strong anti-drink Temperance Movement during this period! The soldiers in the trenches were well aware of the state they were in. 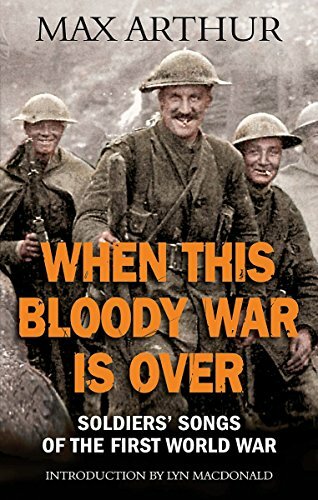 Their clothes were worn, their footwear was totally inadequate to cope with the mud of the trenches - as young men who had once taken a pride in their appearance and smartened themselves up every Saturday night at home, such a situation called for another sardonic tune. And yet these lyrics are heartbreaking because they also reveal how soldiers often felt alienated from the people they had left behind. On visits home they couldn't help noticing that it was often 'business as usual' with many making a tidy profit from the war. And you wore your civvy clothes. The Jerry on the Menin Road. Another popular tune which was sung to the hymn, The Church's One Foundation was We are Fred Karno's Army. Fred Karno was a popular music-hall comedian of the time. We are Fred Karno's army, we are the ragtime infantry. We cannot fight, we cannot shoot, what bleeding use are we? Despite the bitter irony of the trench songs, soldiers found comfort in the more sentimental compositions that reminded them of an idealised home life that they dreamed would be waiting for them. Keep The Home Fires Burning was particularly popular and their own songs gradually took on a more nostalgic feel. To the Hymn Tune "What a Friend We Have in Jesus". Take me over the sea, where the Alleyman* can't get at me. ** A Jack Johnson was a heavy shell, named after a boxer of the same name. America entered the war in April 1917, and in November 1918 the Armistace was signed. Ten million men had died on all the European fronts. Not all had been killed in the trenches. They died from their wounds, from sheer hardship of the war. Many were gassed and blinded. 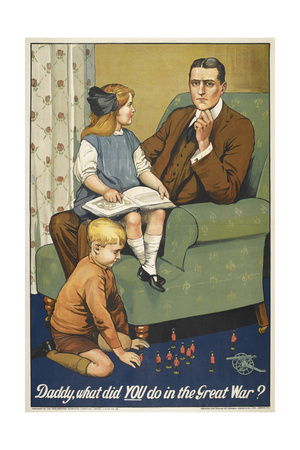 The sorrow of war has been well covered through novels, film and the great war poets. But as Charles Chilton has noted, it is through the songs of British troops in the trenches that we see another, little-known side of the war. These songs are, as Chilton's research has shown, extremely strong, more inclined to be stoical and sardonic rather than despairing. There was a balance between a healthy, almost defiant scepticism and a sincere longing for home and family. At the same time, there was the realisation that all they had gone through could never be fully understood by the people back home. 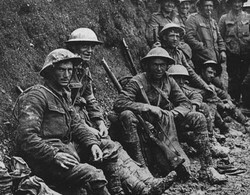 The comradeship of the trenches and the words of the radical, subversive and often suggestive songs created by these men often provided the vital glue that helped them to cope with the mass horror of the dominant trench warfare. Once back home in Blighty there was little hope that those who had not experienced the war could ever begin to empathise. To the tune of: "They'll Never Believe Me"
Regarded by many critics as one of the most moving film sequences ever made. Whilst searching for evidence of his own father, who died in the Great War at only nineteen, Charles Chilton stumbled upon a lost treasure trove of working class history. We have a lot to thank Charles Chilton for. The Long, Long Trail - repeat of the original 1961 broadcast, on Radio 4 Extra, 5th January 2014. The Archive Hour: The Long, Long Trail first broadcast in 1961 and repeated on Radio 4 Extra on 5th January 2014 with a commentary by Roy Hudd. Soldiers' Songs of the Great War , The Western Front Association website. Really moving article, thank you. In an earlier incarnation as an actor of sorts I had a role in Oh! What a Lovely War. It's a wonderful play and it never loses its appeal for me. Where German snipers can't get at me." Abby, Tipperary is in Ireland. The French Revolution inspired English radicals to dare to fight for reform. Their weapons were a new literate artisan class and the printing press.